A well template includes one or more tracks. 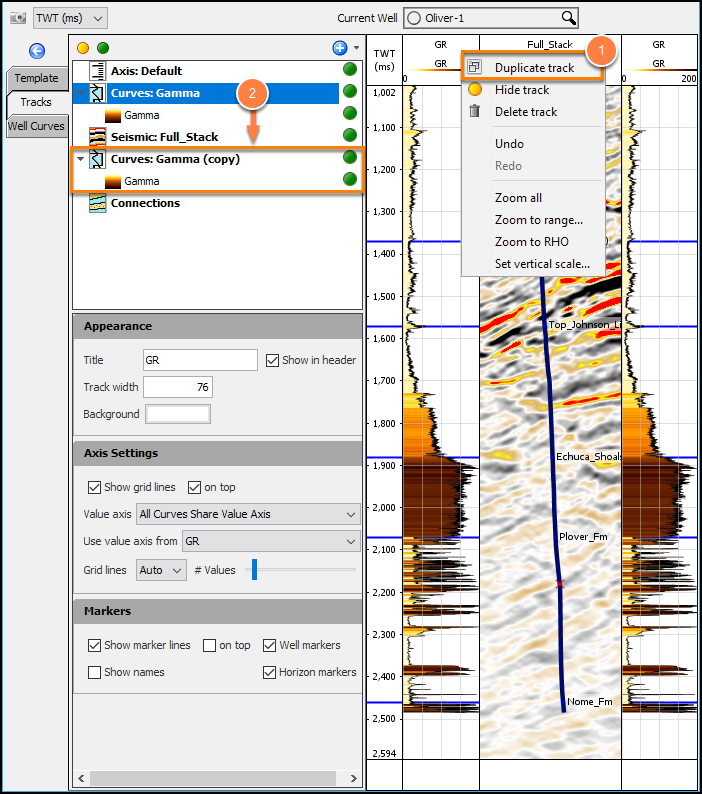 Tracks display vertical axes, well curves, well markers and even regions of data from a volume. Some aspects of tracks can be adjusted directly by clicking or dragging them. Detailed control is available through the Tracks Tab by selecting the appropriate entry. Tracks can be repositioned by clicking and dragging the track header. Alternatively, drag and drop the track in the tree to adjust its position. The width of each track is adjustable. Use the mouse to drag the boundary between tracks in the track window to adjust the width. For tracks contained inside seismic tracks, adjust the width setting for the track in the tree. Axis track - Axis tracks display time, depth or measured depth along the well. Multiple axis tracks can be included in the view. 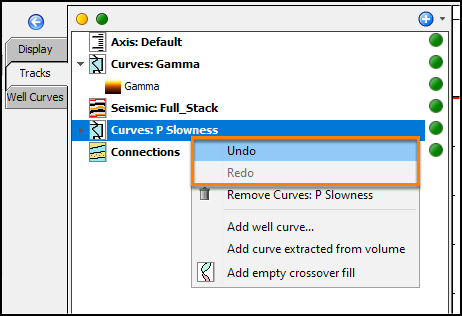 Curve track - Curve tracks display well curves and extracted curves from volumes. A curve track can display one or more curves, or even left empty when displaying marker and horizon annotations. Read about adding Curve Tracks. 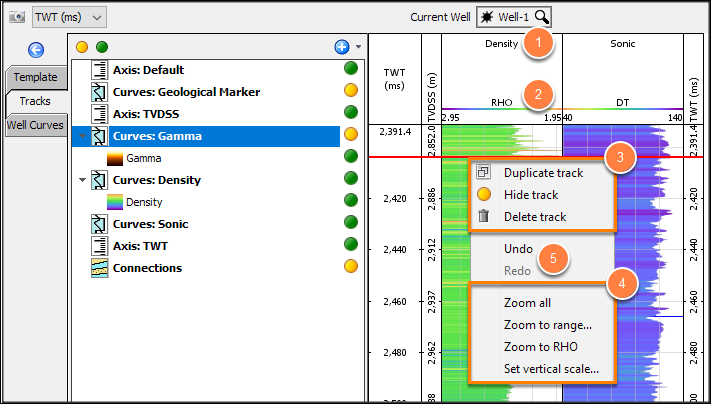 Seismic track - Seismic tracks display regions of volume data along the wellbore or near the well location. 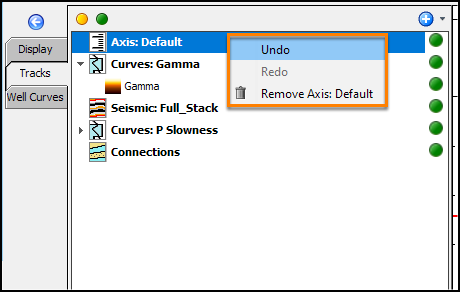 Any volume (not just seismic) can be selected for the display. Gather track - Display gathers along the well bore or near the well. To show/hide track(s), click the traffic light icons (yellow to disable and green to enable) located at the top of the tracks list or next to each track. The width of each track is also adjustable - just use the mouse to drag separation line of any track in the track window to adjust the width. In the displayed view, right-click the track title and select the Duplicate track option. In the configuration tree, hold CTRL and drag the track to a new position in the tree. Undo and redo is available depending on the context.